Remember last week when we informed you that the Samsung SCH-U490 will be a new music phone from Verizon? Today we learned its official name will be the "Samsung Trance" and that it is due out sometime this spring. 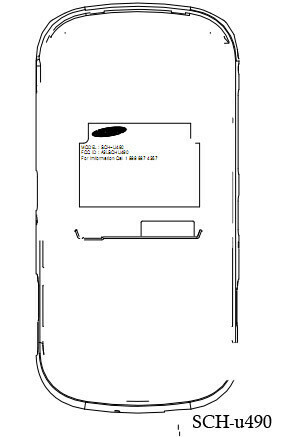 The only image that has surfaced is from the FCC, which is nothing more than a drawing of the back, but the Trance will be a slider style phone with a navigation touchscreen, Bang & Olufsen speaker, 1GB of internal memory dedicated to music, 128MB for downloaded applications, files, and pictures, and a 1.3MP CMOS camera. There is no word on if it has a microSD memory card slot. The Samsung Trance will have a microSDHC slot and can accept 16GB memory cards. i hope its better than the glyde!!!!!!! It's the model replacing the Juke in the 400 Series of Samsung Music phones for Verizon. Pretty sure it will have a Micro SD slot this time around. Hopefully it will have web and EVDO which was missing off the Juke.